Seven Iranian computer experts linked to the government in Tehran were charged Thursday with cyber attacks against American banks and a dam in New York. The FBI released mug shots of the alleged hackers named in the indictment as the charges were announced at a news conference in Washington, D.C. They worked for private security companies that have performed work for the Iranian government, including the Islamic Revolutionary Guard, officials said. But U.S. officials stopped short of accusing Iranian authorities or intelligence of being behind the attacks. FBI Director James Comey said the suspects may be out of reach while they are in Iran -- but the indictments should have them looking over their shoulder if they travel. Forty-six major financial institutions were targeted with distributed denial of service (DDoS) attacks -- in which ackers gain remote control of hundreds of computers and servers and use them to flood a target's server with data, clogging it up so that it can't receive legitimate traffic. The attacks in 2011, 2012 and 2013 stopped hundreds of thousands of customers from accessing their accounts and cost the businesses millions of dollars as they raced to protect their servers, the feds charged. Targets included Bank of America, the New York Stock Exchange, Capital One and ING, and PNC Banks, according to court papers. The hackers allegedly also broke into the control system for a small dam in the suburbs of New York, the indictment says. Lynch said that because of maintenance, the Bowman Dam in Rye was not connected to the computer system, but if it had been, the intrusion would have been "a clear and present danger to the public health and safety of Americans." 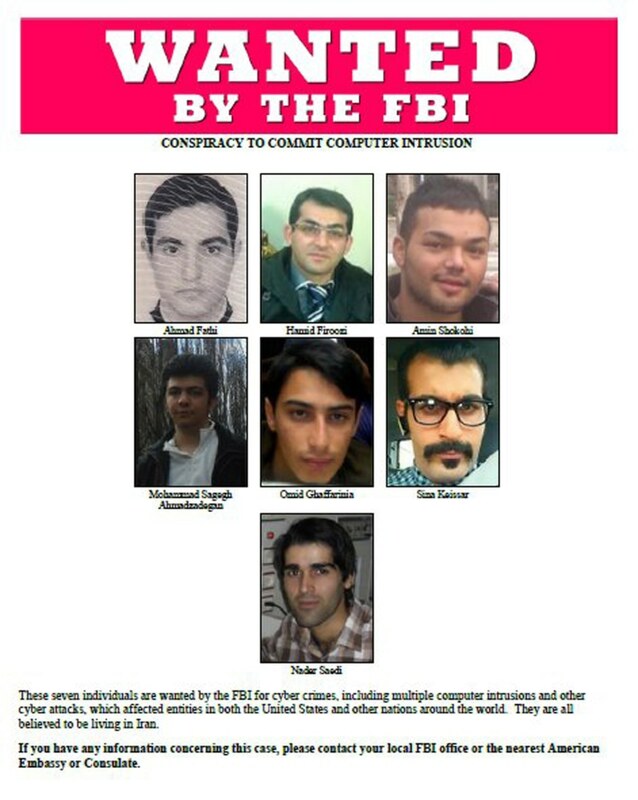 The seven Iranians indicted by a federal grand jury in Manhattan were identified as Ahmad Fathi, Hamid Firoozi, Amin Shokohi, Sadegh Ahmadzadegan, Omid Ghaffarinia, Sina Keissar, Nader Saedi.